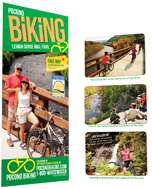 Join us today and enjoy a scenic bike ride through the beautiful Lehigh River Gorge, our most popular biking daytrip. 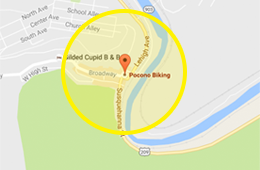 Today, our Pocono Biking Jim Thorpe location is open. From 10am to 5pm, you can rent one of our Trek bicycles by the hour or for the entire day. We also have convenient shuttle services available which allow you to enjoy one way, downhill, rides of 15 and 25 miles. Just choose the time, length, and section that best fits your schedule. Jim Thorpe, PA 7 Hazard Sq. White Haven, PA 501 Main St.
Want to learn more about our Biking Adventures and everything else we offer? Grab your copy of our FREE in depth catalog today! And we’ll send you cool stuff. Like special deals and offers you actually want. Pocono Biking is hiring! Visit the Employment Opportunities page for details. © 2019 Pocono Whitewater Ltd. All Rights Reserved.